happy birthday, mom. you are one of a kind; fantastically funny, charming and friendly, youthful and hip, intelligent and accomplished. you find the best in others, making people feel good about who they are and what they have to offer. you are the best travelin' companion anyone could hope for in life. I don't think your mother could be more adorable! How darling! What a nice post. (tear) ... and the poem describes my mom, too. thanks for this post. if i'm a quarter of the mother she has always been to me, i will call it success. i love my mom so much, too. CHEERS to your mom :) CHEERS!! Let's hope we are as adorable when we hit 60!! that photo is just bursting with personality! 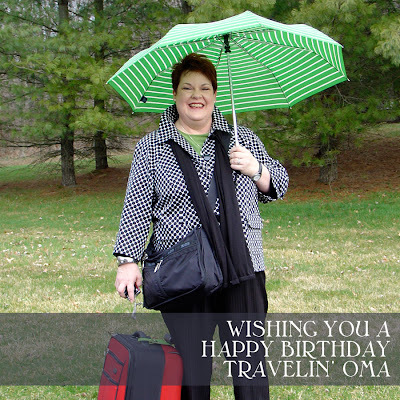 Happy Birthday Travelin' Oma! September birthdays are the greatest! !